The mountain ranges of Bulgaria have a lot to offer visitors besides their famous ski resorts. The mountain scenery is glorious and most activities and attractions in the Bulgarian mountains revolve around outdoor activities and experiencing the beautiful landscapes. In winter, skiing and snowboarding are the activities of choice, and in summer hiking, climbing, camping, picnicking, hunting and fishing are popular. The pretty Rhodope Mountains are known for ecotourism and ethnographic gems like the picturesque village of Momchilovtsi, which is famous for its well-preserved architecture, folk traditions and crafts. There are a number of these charming villages in the Rhodope range: two of the most remote and authentic are Leshten and Kavachevitsa, in the southwest, which are tiny old towns built almost entirely out of stone and remarkably untouched by the modern world. The Rhodope mountains also boast a number of ancient Thracian sites, including Perperikon and Tatul, and some wonderful caves. 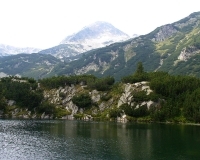 The Pirin Mountains are perhaps the most rugged and beautiful of Bulgaria's mountains and the greatest tourist attraction of the Pirin range is the awe-inspiring Pirin National Park, which is listed by UNESCO. A great base from which to explore Pirin's numerous hiking trails and natural attractions is the village of Bansko, which is an important tourism centre as well as a popular ski resort. One of the most visited attractions in Pirin is the Rozhen Monastery, a beautifully preserved medieval monastery with some valuable frescoes and artefacts. Bulgaria's largest national park, the Rila National Park, is located in the central region of the Rila Mountain range and attracts visitors with its alpine lakes and hot mineral springs, as well as its wealth of natural splendour and outdoor activities. The Rila Mountains boast one of Bulgaria's most famous attractions, the ancient Rila Monastery, and the country's oldest ski resort, the village of Borovets, which is a great place to stay while exploring the mountains. We are looking for contributors for our Mountains travel guide. If you are a local, a regular traveller to Mountains or a travel professional with time to contribute and answer occasional forum questions, please contact us.